The 2018 year was an historic year for the Troop. As you are all aware we won, for the first time in our history, the Rayner Trophy and followed this up with a unique double when we won the Gordon Shield for the first time since 1972. The Trophy and Shield are on the wall to admire. Winning these competitions was a fantastic experience and the pinnacle of years of development and hard work, not only by the scouts but also by the dedicated team of adult scouters. But, we must remember that winning is not the aim of scouts. A winning is not the measure of success in scouts. In 2018 I attended the Wood Badge course (Wood Badge is the highest “qualification” an adult scouter can achieve). One of the valuable things in attending a course like this is the re-examination of the fundamentals of scouting in the context of todays’s world. 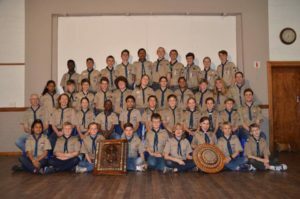 So, in the light of these aims and methods, the question was asked: What is success in scouting? How do we know that we have developed the Character, Citizenship and mind, body and spirit of our scouts? It is clear to me that winning a competition, beneficial as it is to the self confidence of our scouts, is not the measure of success. After much discussion on Wood Badge, the conclusion was that success is measured by the achievement of First Class..
A scout who has achieved First Class has done amazing things: organised and let a patrol camp without adults present; organised community service with other scouts; organised and led and an ovenight hike without adults present. In effect they have learnt teamwork, responsibility, organisation, self reliance, resiliance, perseverance. Scout Law No. 1 states that a scouts honour is to be trusted. To achieve First Class a scout has to be trusted. Their peers must trust them; the scouters must trust them, their parents must trust them and the parents of the other scouts must trust them. Recently we set 6 of our senior scouts on the Outeniqua and Harkerville Trail. They were there alone, 600kms from any adult support, for 6 days, hiking on unfamiliar territory, managing their own food and water and group dynamics. And if you think about it, the trust is amazing. So too, the trust that we show in our scouts when they work towards their First Class. The trust to do the right thing. We would like to see all our scouts achieve at least First Class before they leave scouts. Some will go on to Springbok but for many First Class will be the highest advancement they achieve. And we will be proud of them and they should be proud of themselves. For they will have achieved something special and all their lives they will benefit from the difference that scouts has made to their character. So, as we move into the new scout programme, I want parents and scouts to think a few years ahead and aim to achieve your First Class. For parents this will means trusting not only your child but also other scouts to “do the right thing”. Trust the scout method to give your child the character and the development that will benefit them throughout their lives. Allow your children to experience scouts to the full. You may never see the direct benefits but I promise that they are there.